This post is linked to: A Gluten Free Holiday I, Hearth and Soul Blog Hop and Slightly Indulgent Tuesday. A couple of weeks ago, I had the opportunity to do a guest post on Go Dairy Free, the wonderful website about all things dairy-free, run by Alisa Fleming, author of the amazing cookbook, Go Dairy Free (who, incidentally, also authors One Frugal Foodie). I chose to feature my Banana and Fresh Cranberry Muffins that I usually only whip up during fall and winter months because, if you have ever tried to find a bag of fresh cranberries during the middle of summer, you will quickly find that your efforts will most likely be met with defeat. Now there is just something about the winter months that inspires me to think up innovative and resourceful endeavors involving the elusively tart but nutrient-dense cranberry. I normally find myself using them in holiday decorations, as glistening accents to my meals, and as beds for my tea light candles. Of course, I also love to throw a few frozen ones into my champagne, or, better yet, my vodka cocktails, as well (but that is for after the kids go to bed). But, on chilly nights when those silly boys of ours just will not hit the hay (and therefore Mom and Dad cannot hit the sauce), we love to make mulled cranberry juice by simmering cranberry juice, cloves, fresh cranberries, cinnamon sticks, and sliced oranges together for about twenty minutes. But finding ways to use fresh cranberries as the star ingredients in my recipes that do not involve alcohol is a challenge I also like to tackle. I have a number of cranberry-inspired dishes that have been successful, but these Grain-Free, Dairy-Free Banana-Cranberry Muffins have been the chosen favorite in my family involving these antioxidant-rich berries. The sweetness of the bananas, the slightly sweet dried cranberries, and the dash of honey add a perfect balance to the tartness of the fresh cranberries that are also called for here. 1. Preheat oven to 325°F. Line 12 muffin cups with paper liners or grease the muffin tin thoroughly. 2. In large bowl, mix oil and honey with electric mixer. Add egg yolks and continue to mix until blended Add bananas and mix until incorporated. 3. In another bowl, whisk together almond flour, baking soda, and salt. 4. Slowly add almond flour mixture to wet ingredients in mixing bowl and mix on low speed until just incorporated. Do not over-mix. 5. Once incorporated hand mix in dried and fresh cranberries until just combined. 6. Beat whites until soft peaks form, then gently fold into batter until just incorporated. 7. Spoon batter into the muffin cups, filling only 2/3 of the way full – do not over-fill. Sprinkle Turbinado sugar evenly over each muffin. 8. Bake 20-23 minutes, until toothpick inserted into the middle of a muffin comes out clean and they turn a golden brown. Do you have any fun ideas for cranberries? I would love to hear them. I have three bags of fresh ones sitting in my refrigerator right now that I would love to try something new with. This couldn’t be a more timely post for me. I’m all geared up to make cranberry muffins this weekend and I like this recipe. I have the almond flour on hand and have been looking fwd to using my fresh bag of berries! Hi Cristina!! 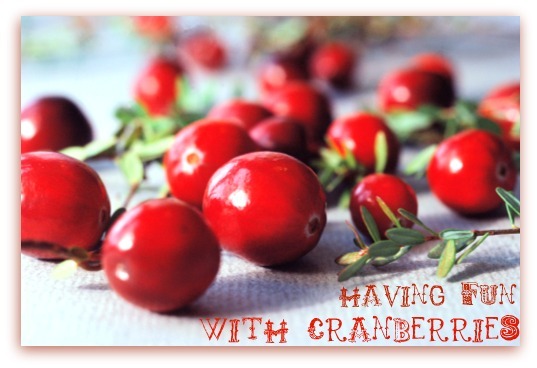 Knowing your creativity, I am absolutely sure that those cranberries of yours will be put to excellent use!! Hi Jenn! I also make a similar sauce for Thanksgiving (in fact, I am going to be posting about it soon)! You are so right, it is really simple, but amazingly good. My kids even really like it. They love spreading it on their sandwiches the next day with the turkey! Oh, I love this post, Kim! Such fun … you always provide such a “good read” as well as a great recipe! I was just looking at recipes for cranberry cocktails the other day. They have such eye appeal as well as taste. 🙂 But, yes, sadly, one cannot use cranberries entirely for cocktails. 😉 But maybe not so sadly, when one has a muffin recipe like this one. That photo is such perfection, it almost doesn’t look like a photo … more like a glorious oil painting. Seriously. Thanks for this one, Kim! Aww! Thanks, Shirley! I think there is something about the color of cranberries that also totally draws me to them. If you make it to my house, you will see that there is the color red spread throughout. It is one of my favorite colors – so warm and inviting. I will have to post what my indoor holiday decorations look like one of these days – pretty color coordinated (red, red, and more red, lol). Thanks Lex! The DIgestive Wellness flour is by the far the fluffiest and lightest one that I have tried yet. It really makes for the lightest texture and is my favorite by far to work with. Kim! These look perfect. 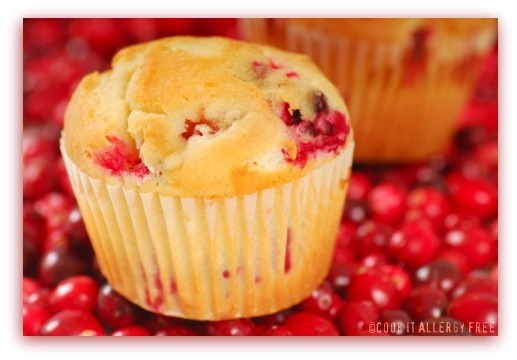 I love how you put the muffin on the cranberries for the photo – you’re gifted girl! I also love how these are grain-free. Amazing! I can’t get Honeyville in Canada so I’ll have to see if I can get Digestive Wellness so I can try it and see what the difference is. I love cranberries because of their tartness. I don’t eat turkey anymore but I always add some cranberry sauce to my plate because I love it so! WOW! These look amazing. I’ve never cooked with Almond flour before… I’m intrigued I must go buy some! Make sure you stop by Katie’s Cucina and link up this recipe and other great ones too! Yummo! Love that color and tart cranberry flavor! Hi ButterYum! Thanks so much! I love the tartness too! Sometimes I just crave tart over sweet (not often, but it does happen 😉 )! I made these delightful muffins today & they were the best!! All of my friends loved them!! Thanks again for your tasty & lovely recipes! You Rock! Many greetings from Brussels, Belgium! Thanks for sharing Kim, this is an amazing recipe! Hi Alisa!! 😉 Thanks for letting me share this one on your site! ps I think a couple of my comments are sitting in your spam box…again. Oye! We can only get frozen cranberries here in Australia of course, so could I use those instead? And isn’t a ripe cranberry supposed to bounce or something? Kim, Kim, Kim – these look fantastic!!!!!! I’m flying all the way across the country for tea and one of these babies. You up for company???!!! Great post with wonderful photos. I haven’t used fresh cranberries and you’ve inspired me to try. I’m on a muffin kick right now and made blueberry ones and pomegranate muffins. This will be my next recipe to try, so thanks for sharing! Hi Dakota! Pomegranate muffins?? Those sound divine! You have intrigued me enough to try that! Yum! Thanks for stopping by! Never would have thought of banana & cranberry together, but sounds positively delicious. Hi Ricki! These are one of my kids favorite muffins. And I love that they are grain-free for a bit of a healthier alternative. Thanks for being one of the hosts in this great GF Holiday event!! Ripe cranberries float – yes? I love the sound of these muffins – and that they are g/f – I have a friend whose children will go crazy for these – I am sending her the link. Thanks for sharing this with us at the Hearth and Soul Hop! Christy, you are right. Ripe cranberries float in water, or bounce if you drop them on the counter. Thanks for letting me share these muffins at the Hearth and soul Hop this week! Yum. I’ve been looking for a healthy versatile muffin. I will be trying this recipe today.The cranberries sound perfect for the season, but I will also try it with other berries as well. thanks for a great recipe. Any substitution ideas for the baging soda and salt?? I really will try this one – looks fantastic.